The old unrefined wooden table and the wooden logs in the ceiling further build on the rustic character of this outdoor seating space. Tip: Use old wood to contrast modern furnishings! Stairs from reclaimed wood balance out the stark white interiors by offering the right dose of rustic charm! Flanks of reclaimed barn wood have been used ingeniously to create a unique statement wall in an otherwise contemporary space. We love how it is adorned with art! And you will never guess who is the owner of this Manhattan retreat...: Hilary Swank! Natural beauty is the emphasis in this polished bathroom where contrast is the key. Loving the wall fixture made out of old wood... it definitely is the star of the space! Have an unused old wooden door that doesn't seem to fit anywhere? Who knew it could own the center of your living room as a coffee table! Look below! Logs of wood that would otherwise be considered scrap become an interesting element through this DIY tripod lamp! We love seeing the subtle merging of rustic elements in modern and polished settings. This summer house has been adorned with re-purposed wooden logs as furniture to offer that laid-back feel! Are you going to go the sustainable way at home? Reclaimed wood is definitely the place to start. Go soft with pastel pink! We adore pale colors for their lightness and subtlety but when we think of a pastel color that is comforting and uber-soft, not a better option comes to our mind than powder pink! The comforting hue has obvious references to femininity owing to it's psychological associations with qualities such as compassion, sensitivity and love. Thanks to the overall darkness and the lovely soft-pink armchair that punctuates it, the interior below possesses a mysterious kind of glamour! We love the play of darkness with softness! Interesting space to take your cue from, isn't it? Never boring! The powder pink hued bedroom below is made oh-so-interesting by the clever incorporation of textures. Pastel on pastel! We love the pairing of pastel pink and powder blue in the room below. Pink brings a sense of comfort and the blue adds to the serenity of the space. All in all, this space is a quite a cozy abode! How about a pink feature wall! Pale pink acts as the perfect soft backdrop to hang art in the room below. See how the black masculine frames pop out against the subtle feminine color of the wall! Pink accents punctuate the white ruled living room to offer a soft, feminine appeal! Those brilliant spaces have inspired us to dress our homes with some blushy, powder pink! How about you? Simple or complex: How do you like your patterns? It's a no-brainer that patterns play a very important role in interior styling; after all they add personality, style and texture to any space. When it comes to patterns, there are myriads of options available to choose from; be it geometric, stripes, polka dots, plaid, or more traditional motifs. How you mix and match these various patterns and colors is very important in defining your space and style... and while some people prefer to keep it simple with patterns, others like them bold, busy and often eclectic! We came across two bedrooms decorated with patterns, albeit very differently! Let's have a look at these two bedrooms and decide which one agrees with your style. This rather simple bedroom in white is adorned with multiple prints, but in order to keep it simple, the patterns have been chosen in a single color: blue, which happens to gel beautifully with the overall light background. Hence, the patterns add interest to the bedroom but at the same do not complicate the calm setting! Moving on to this glamorous bedroom spangled with Egyptian, Greek and Moorish motifs! Although it may appear too busy to lovers of minimal style, the explosion of textures and patterns actually makes for a very interesting and witty space. The room looks balanced despite of all the contrasting textures. So how do you like your patterns? Have you made up your mind yet? Which of the two bedrooms would be your private retreat? Often touted as the world's first moulded plastic chair, the Panton chair is the creation of Danish designer Verner Panton and a timeless masterpiece of Danish modern design! This S-shaped chair created a sensation during its launch in the 60's owing to its sleek and curvaceous design which reflected the "Space Age" of that decade. The sleek, curvaceous and modern looking chair has been recognized as a design "classic" and is part of the permanent collections of some of the most famous and reputed design museums across the globe. It has even been featured on the cover of Vogue with the equally stunning Kate Moss! This mid-century gem is not your everyday chair and if you're looking to add a piece of unique yet celebrated design to your space, then it is just right for you! It will serve as a nice conversation starter and definitely impress your guests! Have a glimpse of some of our inspiring space finds featuring the iconic Panton chair below! Wondering why the space below appears so beautifully composed? It has to be the contrasting pairing of the sleek and refined Panton Chair with the rough and rustic furnishings! 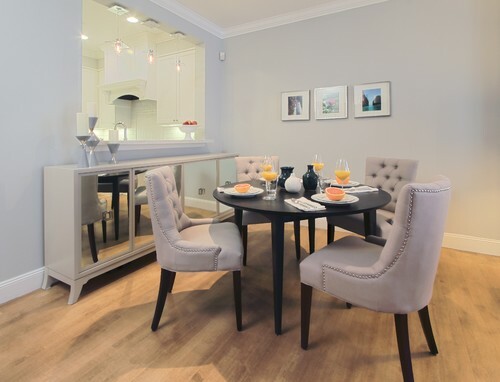 This light and airy contemporary home has the perfect dining experience in store for any design enthusiast! The iconic chair possess the ability to mould itself beautifully to adapt to its surroundings. We love this Panton chair in pale pink. It would look perfect in any girlie girl's room! Modern, classic, timeless, the Panton chair is a piece of furniture that will add effortless elegance to any space! Multiple mirrors for visual interest! Multiple objects are often used in spaces to create visual interest. A mirror can act as a gem on a plain wall and this effect only increases multi-fold times when several mirrors are used! Hence we decided to list out different strategies, along with interesting images as examples, for using multiple mirrors in a space. Have a look and get inspired! You don't always need to use wallpaper when trying to create a feature wall! You can transform a simple wall into a statement one through the use of multiple mirrors in different sizes and designs but all of them with frames of the same material. Unlike a wallpaper, such frames would lend a nice texture to the wall as well! And finally, go for the ultimate mix and match! Keep an eye though on the proportions and the distance between the mirrors. Who needs art when you have an array of gorgeous mirrors with the most artistic frames beautifying your walls! So which wall is it going to be? Go ahead and experiment with multiple mirrors! Embracing animal print: Subtle infusion or maximal inclusion? Animal prints never really go out of fashion. We compare two spaces and let you decide how you'd like to embrace these zesty prints in your interiors. This hallway is the epitome of luxury with all the glossy, lacquered walls and we just love the subtle incorporation of animal print through the upholstered chairs! So, would you prefer to introduce the prints minimally through accessories and furnishings like in the space below? The following space is a perfect example of maximal use of animal print in a space! The idea of dressing walls, as well as furniture, in animal print may appear absurd to some, but there are certain people for whom this would be a maximal delight! We think it may be a good idea for a corner space or a small room but try it only if you're bold enough! Have you made up your mind... What would be your "decorating strategy" with animal prints? Subtle infusion or maximal inclusion??? Looking to add a new feel to your interiors? You do not necessarily need to burn your pocket every time your space needs a makeover! Look around you and you will always find some old objects that can be re-purposed and brought back to life with the help of a bit of creative thinking. And there is no better place to start than... tables! Have a look at some inspiring ideas that we collated for you. This drum has been re-painted and stickered to appear as a Chanel perfume barrel. It serves the purpose of a striking bed-side table! The reclaimed wine barrel has been fashioned as a coffee-table, and it isn't hard to see that it complements the surrounding wicker chairs perfectly in this rustic-chic space! This old wooden door would be a perfect flea market find for someone who knows how to up-cycle it! The owners of this space have showed their creative flair by ingeniously using it as the top of a coffee-table for their white living room! Gorgeous contrast, isn't it? Finally, if you would like to go all green, you may convert an ordinary log of wood into a functional side-table such as the one below! We hope to have inspired you enough. Your next table may be around the corner! In the history of France, the period of Louis XV's reign was a time of peace and prosperity and was regarded as the Golden Age of French Furniture. Comfort and convenience were all the rage at that time and hence the Louis XV chair was born! These chairs satisfied the society's craving for comfort at the time and owing to this very comfort-factor and the antique-look that they offer, these Rococo style chairs still play an important part in today's interior styling as can be seen in the pictures below! The striped fabric, used for upholstering, offers a modern twist to the antique chairs. Making inspiration from the Louis XV chair, creative genius Phillippe Starck created a modern interpretation of the the neo-classical chair, known famously as the "Louis Ghost chair" (owing to its colorless and soulless appearance). This interpretation offers the same comfort, style and elegance but with a modern twist. Here are some inspiring ideas and ways to use the Ghost chair! The transparent look of the Ghost chair makes it appear as if takes less space, hence the subtle elegance offered by it makes it the perfect complement for a minimal, clutter-free interior such as the ones below! The chairs offer the illusion of more space in this small kitchen too and it is quite evident that any other chair would have made the space stuffy! Also, we love how these chairs go beautifully against the more traditional setting of this kitchen! Want to go for a contemporary-classic look? The Ghost chair offers a contemporary twist to this master en suite that is ruled by touches of classic furnishings and accessories. How unmatchable yet how balancing! We hope that by now we have made you love the Ghost chair even more. Go on and incorporate some Ghost chairs to transform your home! Pink or blue: Which one is for you? Pink is for girls and blue for boys, we're told! If you were to be given a choice between two almost identical spaces that are accessorized differently; one in pink and the other one in blue... which one would you go for? For a moment, let's ignore the cultural gender associations that have been imposed upon these two colors and get into some color psychology to help you clear your mind in order to help you make the right choice! Pink (being a combination of red and white) stands for the power and passion of red softened by the purity of white. In color psychology pink is associated with hope, positivity, tenderness and kindness. On the other hand, blue is a color which is mostly associated with peace, tranquility, trust, honesty and loyalty. It is also known to promote mental relaxation! So, now that you are aware of the respective power of the two colors, let's have you chose one of these two similar spaces! Would you go for this space accessorized in pink accents...? ...or this one ruled by blue? ...which one is for you? Achieve visual interest through contrasting elements! Mixing and matching similar decoration elements can create and emphasize a certain style of interior design but it definitely is not the only way to create a well-balanced space! Sometimes opposing and contrasting elements complement each other beautifully, bringing out the best in each other. Keeping this concept in mind, we bring to you a few inspiring ideas on achieving visual interest through the mixing and matching of contrasting elements! The finish of this space has been kept smooth and we love how the hanging bell shaped lamp has been placed beautifully in this composition with its opposing rough texture... It makes the lamp stand-out and the look all the more interesting to the eyes! If you have an eye for geometric shapes and lines then it's an awesome idea to play with them. For example, imagine sinuously curved Egg chairs, like the ones below, placed in a minimal space ruled by clean lines.... The magic of juxtaposition! The magic of juxtaposition is not just limited to these tips... As long as you are ready to be imaginative and experiment the world is your oyster! When doing up a space most people focus on the obvious: colors! Inadvertently, most of us ignore another equally important aspect: texture! Never underestimate the power of the feel of a space (read texture), because a clever play of differently textured surfaces can help you achieve the perfect interesting interior! Read on to know how to do just that! If you would like to go for a rugged look for your décor then rough textures like the ones you find on unrefined walls, aged furniture, patina, etc. will complement your style as they are synonymous with aged, outdoors and rustic settings. Do keep in mind though that rough textures absorb more light, so it would be wiser to use such surfaces in large spaces. We admire the texture play in this space...the unrefined stone wall strikes a beautiful contrast with the white walls, while the grand tufted sofa adds another dose of texture! As far as smooth textures go... polished, refined and gleaming surfaces are associated with luxury, modernity and sophistication. Hence, go for smooth surfaces to embrace a more luxe feel at your home! Since smooth surfaces reflect light, they can also prove helpful when you need to make a small room appear spacious! The dark floor of this bathroom may be an unconventional choice however it is its lustrous finish which makes it appear so luxe and elegant! With textures comes the ability to be creative. And remember, you don't have to use the same texture all through your space! Incorporating different textures creates contrast and visual interest. So what are you waiting for? Go ahead and get creative with textures!!! Looking to add a touch of elegance to your interiors? Well, velvet may just be right for you then! Historically, velvet has been the preferred fabric of choice of the wealthy, hence little wonder that it has come to symbolize luxury and opulence. There is no denying the fact that this rich and lustrous fabric will add an aura of nobility to your interiors, but lets not overlook the fact that this extra-smooth fabric has its many inherent advantages that make it a suitable choice for interiors. The thickness of the fabric is apt for adding warmth to a room in the chilly sub-zero temperatures of winters, although we'd also like to mention that there are many types of light weight velvets that may suit your need for the warmer days. Also, the fabric drapes well and is quite durable, hence perfect for your upholstery requirements. Be it curtains, throws, upholstery or decorative accents. Velvet is sure to find space in your home. Let's go through some velvety spaces to get inspired! This plush, red bedroom is sure to get you in the mood for some romance any day! The velvet headboard and cushion add to the sensual effect. Plush, blue library! We're certain that the soft and supple velvet sofas will coax you into staying and reading more than you had planned to! The walls of this lavish bedroom are a visual delight because of the thick textured velvet upholstery. The velvety curtains will block out the chill at night, while in the day they will absorb the sun light to keep you warm, and comfortable in your slumber. Another great use of long lasting and durable velvet fabric is to use it to recover your old chairs, benches and sofas! We love how this velvet covered ottoman adds warmth to this white master bath. Are you excited enough to add some velvet into your interiors? Another masterpiece from the collections of the iconic curved glass manufacturer-Fiam Italia; this monolithic chair is created out of 12mm thick curved glass! We think it will fit perfectly in outdoors or indoors as well as in a modern setting or a classical one. Where do you see it? How does one define a glamorous space? Is it all about lavishness; plush fabrics, fancy furniture, expensive metals and crystals? Well, in the truest sense, glamour is not just about sparkly things or opulent posessions and it's definitely not just about the expensiveness of it all! Glamour is elegance; it's about a certain charm and mystique; glamour is about imagination. In order to create a glamorous space, one needs to stretch the boundaries of imagination, and create a place that is a little whimsical, but very alluring, and last but not the least, functional. Your space need not be all out glamorous; just choose one or two interesting elements that appeal to you or your style, and amp up the glamour quotient of your space. Let's read how! 1. Add a bit of femininity, and don't be afraid to play with colours and furnishings. Thanks to Hollywood; glamour is often associated with femininity, and blushy-pink colour; if glamour had a gender, it would definitely be female! The space below is adorned in a soft, salmon-pink shade, which is contrasted aptly by the black chandelier and the sole black chair, thus creating a sense of drama. What lifts up the drama further, is the eye-catching button-backed ceiling. This space has the colour, drama and wit to be considered glamorous! Take a cue from this space, and experiment with colours and furnishings. 3. Introduce metallic tones and shades. This kitchen might be simple and minimalist, but that light reflecting gold leaf wall adds the necessary oomph factor for the requisite glamour quotient! Note: Incorporate metallic tones into your space. It need not be just gold; bronze, brass and copper shades are very much in too! Flowing draperies exude the kind of drama a glamorous space craves for. Just have a look at the space below; with an eye-catching chandelier, flowing curtains and the dark, cozy feel, the space below possesses the kind of mystery and charm, only a glamorous space can offer! 5. Go grand and scale it up. 6. Drama, drama and more drama! Glamour also means drama. One grand chandelier is great for some drama, but multiple chandeliers? Even more drama! Have a a look at the spaces below, and you'll know what we're talking about! Here's hoping we've inspired you today; stay glamorous! Designed by Jaime Hayon for Swarovski, the 'Sparkle Shady' features a series of light shades covered in a textile and Swarovski crystal 'skin'. The resulting structures can change shape, creating an eversurprising, ever-engaging living installation! Designed by Javier Mariscal for the Spanish furniture company Vondom, the 'Mora' lamps will fit beautifully in any outdoor or indoor setting and lend it a soft magical glow. And we love that they just won't look great when turned on at night; they can even look equally beautiful in the day because of the patterned surface! Enchanting 'Mist' installation from Lasvit! 'Mist' is a premium design concept by Lasvit which captures the mystery of fog through beautiful iridescent shells of hand-blown glass that glimmer with opal tones to amplify and reflect natural lighting. Check it out below! Gray can be glam too! When it comes to the word 'glamour', rarely do we associate the colour gray with it... maybe it's because gray is considered an emotionless neutral or just because most of us usually associate glamour with everything shiny and gold. But we are of the opinion that when done right, even a colour as subdued and as minimal as gray can look glam and expressive! Its varying shades, whether light dove or dark charcoal, make gray as versatile as any color. Textured fabrics make this neutral-gray bedroom interesting by breaking the monotony. Contemporary Bedroom by Chicago Interior Designers & Decorators Interior Enhancement Group, Inc. Burst of colour, texture and pattern make this gray-ruled bedroom oh-so-expressive! Traditional guest bedroom by Portland Interior Designers & Decorators Garrison Hullinger Interior Design Inc.
White moldings are the perfect companion for gray walls. Touch of dazzle is all you need... the detailing on the chairs, and the mirrored console make this dining space gray and special! This gray bedroom is given a touch of glam through those very inviting faux-fur cushions! The dark wood table goes so well with the gray tones of this dining room and gives it a contemporary and gorgeous look. 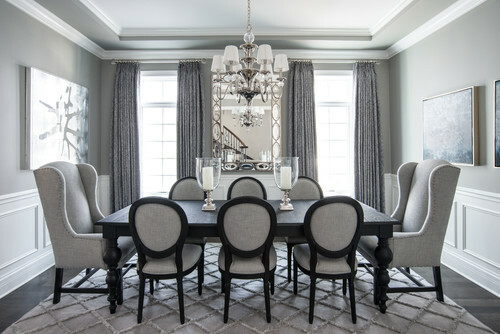 Traditional Dining Room by Elmhurst Interior Designers & Decorators Kristin Petro Interiors, Inc. The dark gray cabinets are the perfect backdrop for these lovely light fixtures in silver. So, whether your are trying to add a tone of glamour to your kitchen, dining room and bedroom do not be afraid to use gray. 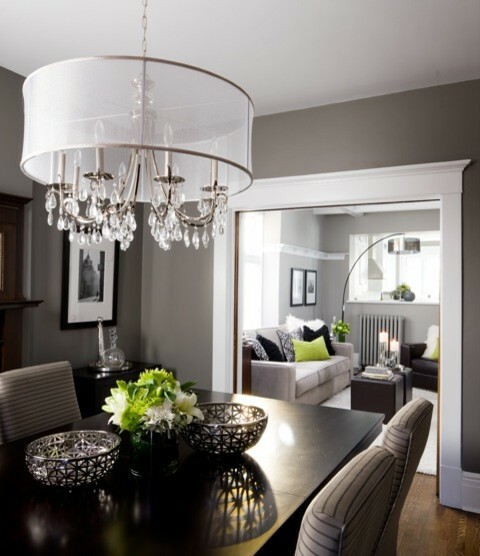 Not too bright, neither too dark, gray can effortlessly add glamour and drama to your interiors. 'Tweetie Pendant Light' by Jake Phipps! The fun 'Tweetie Pendant Light' re-imagines caged birds that were once upon a time in history kept as a tribute to the beauty of nature by the Egyptians! These lights will surely bring light, song and conversation into any environment! Like most of his creations, this magnificent free-standing mirror called 'Caadre' by Phillipe Starck is truly a masterpiece! Available in various versions and number of finishings, you can customize it to perfectly fit your styling needs and display the reflective masterpiece to its best!